A letter of approval of the host’s local center for this exchange. All these documents should be sent by e-mail to dorothee.leroux@chru-strasbourg.fr no later than the 15th June 2018. The applicant has to identify a host in the list of ERN-EYE’s HCP that are willing to welcome an applicant, if the applicant wish concerns another site then on the list we cannot guarantee that the application will be possible . A letter of approval of the applicant’s local center for this exchange, including the statement that his/her salary will be maintain during this short period. The host center should be a full member of ERN-EYE. This exchange program is on stand-alone, one time basis. All applications will be evaluated by a scientific & medical committee, named by the coordinating committee. The proposals will be evaluated on the soundness of the added value for the trainee and the host in the field of rare eye diseases. The grant will consist in reimbursement (travel and on site costs) upon proofs of payment up to a ceiling of 1250€. Once awarded the applicant will send us an official paper from his/her bank with the IBAN/SWIFT/BIC codes and with his/her name and address. Only European accounts are authorized. 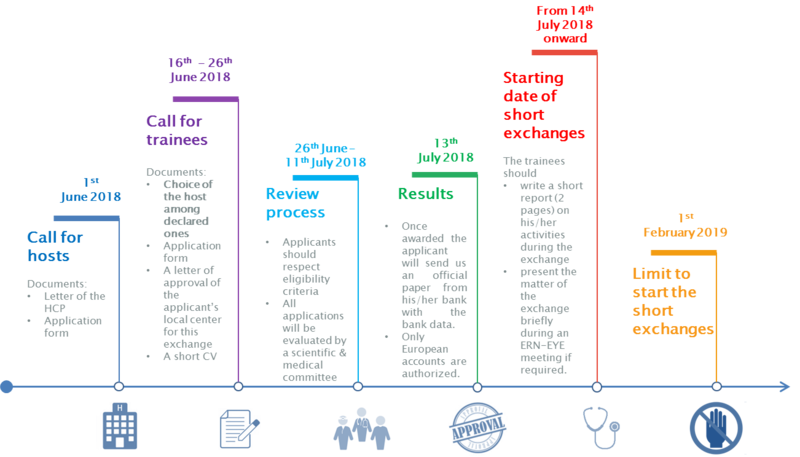 If awarded, the trainee engages himself/herself to produce a short report (2 pages) on his/her activities during the exchange program 3 months after his/her return and to present the matter of the exchange briefly during an ERN-EYE meeting if required.